“Physical therapy went very well. My therapist, Bob, is my buddy. He did beautifully and he helped me out so much. Nursing has been very good, and they always helped me out. Everything went perfect and I am very happy.” – Louis S.
“I am proud to have served as the MDS Coordinator at Cortlandt Healthcare for almost 5 years in the making! Together, with our team, we pride ourselves with helping our residents and families by providing them with the highest level of quality care and a place at which they can call their home!” – Beatriz R.
“Over the past couple of days, I have felt rejuvenated and stronger. I want to be able to return home with this same feeling and being able to know more about my exercises so I can continue them at home. The nursing staff is just beautiful and they are doing very well taking care of me! Things have just been wonderful!” – Dorothy C.
“The staff was very good to me! The food was very good, as well. What I liked about it was the fact that I was able to have choices of my meals and the menu provided a lot of alternatives! The housekeepers do a great job at making sure the place is kept clean and everything was exceptional. I think I did very well in therapy. I see myself as an impatient person, and they taught me how to be more patient and really understand my exercises. The physical therapy was done very thoroughly and the staff was very helpful and willing to explain each exercise to me and the purpose of it. Overall, the nursing staff and rehabilitation team were excellent!” – E. M.
“Everyone I am working with is very thorough. They make sure I comfortable and that I can do it! All my therapists are very good. There is no stress and they all look out for my safety. Everyone tries to make sure I am being safe, and if I’m not, they explain to me why it is unsafe. I am very glad that I am here. This place is very neat and clean! I am very comfortable here!” – Edward C.
“I love coming into work every day and to know I am making a difference in the lives of our patients; they are making a big difference in mine, too!” – Miranda W.
“Really, all I was thinking about was getting better, but (I see) the staff are affectionate, and really care about me, and that helps a lot. They make me feel like I matter! They have been doing great! I give them an A+! They seem to really care and that matters to me because that’s what will help me get better, knowing people care about me.” – Ella M.
“Everybody in therapy is so kind, considerate, and professional. I am so impressed with everyone! Everyone has been exceptional and overall my experience is excellent and I am very satisfied!” – Joseph S.
“The physical therapy staff are amazing! They are very helpful and they are always there to assist. I love how patient and understanding they are. If I don’t feel ready to do something or need more time, they allow me that.” – Kate A. “Everyday I always get a smile from a staff member that helps me through the day”. 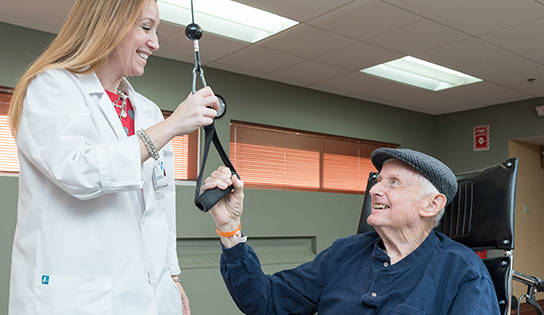 “Cortlandt Healthcare is a phenomenal facility. I highly recommend it to the entire Westchester if needed. The entire staff should be commended for their outstanding care”. “My husband, Pasquale Scalfaro, was a patient at your facility from 8/29 to 11/24/14. We would like to express our appreciation to the third floor staff for all they did to aid in his recovery. Rather than filling out individual Sunshine Cards we would like to thank Joan, Laura, Peggy, Eric, Jenn, Millie, Eunice, Lavina, Joanna, Maria, Jellisa (and any other of the nursing staff that I may have left out). They were all caring and responsive to his needs. They also showed patience with his limited speech and were quick to smile and share a laugh with him. I can’t give enough praise to Maryann and Sean of the therapy staff. They were very professional in working with him but treating him like a family member. Both Sean and Maryann always took time to answer my many questions and keep me updated on his progress. Moishe and Renata listened to my concerns and did their best to try to resolve issues that I raised, weather it was about paperwork, quality of food, staffing or fixing the leaking toilet in his room.